Panzerkampfwagen III ausf N medium tanks are unloaded form a transport. After Operation Torch landed 225,000 Allied soldiers in North Africa, the Germans and Italians built up their forces. 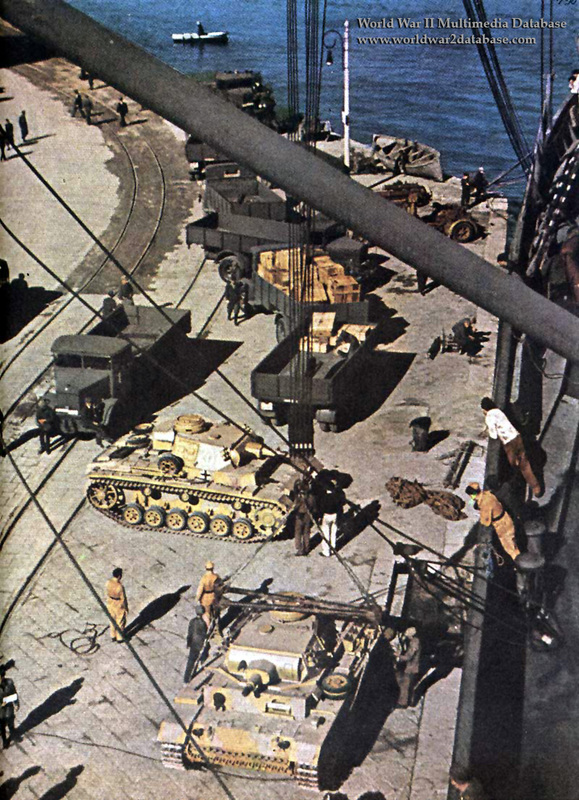 During November 1942 transports brought to the ports of Tunis and Bizerte 176 tanks, 131 artillery pieces, 1,152 vehicles, and 13,000 tons of supplies. Schwere Panzer-Abteilung 501 (Heavy Tank Battalion 501) arrived in Tunisia between November 23, 1942 and early January 1943. To assist their Tiger Is with reconnaissance and anti-infantry duties, the Panzer III ausf Ns (Sturmpanzer IIIs) were sent along. Their 75mm short-barreled guns were excellent infantry support weapons, and their speed and reliability rendered effective assistance to the high-maintenance Tigers. By Christmas Day 1942 12 Tiger Is and 16 Panzer IIIs were in Tunisia, and after the occupation of Southern France and the rest of schwere Panzer-Abteilung 501 arrived, the twenty Tiger Is were slowly whittled down by offensive operations. By March 10, 1943 only six of the heavy tanks and twelve of the mediums are operational. Schwere Panzer-Abteilung 501 and 504 were merged on March 17. On May 12, the remaining units surrendered to the Allies. Schwere Panzer-Abteilung 501 was reformed by elements that were flown out before the collapse and fought on the Eastern Front. Date and location estimated.